The name's the same, but the experience is much different. Luigi's Mansion's debut as a Gamecube launch title had a lot of interesting ideas, but it's taken just over a decade for Nintendo to approach the concept - puzzle adventure as Mario Bro. turns ghostbuster - again. Luckily what was once a left-field choice for one format's launch title becomes one of another console's best adventures. Even more amazingly the game's not even created by Nintendo. Next Level Games, partly responsible for the Mario Striker series and who have worked closely with the company for many years, claim development duties here, yet the game feels every inch a game built in the bowels of the Japanese giant's development studios. The basic concept ls the same; you explore haunted locales with flashlight in hand to spot ghouls, and use vacuum cleaner-turned-ghost busting kit to grab them. You solve puzzles, collect money. Luigi, despite having the experience now of battling spooks, is still as nervous and anxious as first time round. The big difference is the sequel's much bigger than the original. That took under six hours. Here? You can happily hit fifteen hours chasing ghosts. That's fifteen hours of incredibly varied content. The game's split between five mansions, exploration of which is subdivided into multiple missions, and new areas opening up with the right key or equipment at hand. Tackling ghosts is easier this time round; there's seven basic spirits versus the multitude of the original, but there's much more variation to the gameplay as well as a really interesting set of bosses, all of which makes for an entirely different approach to the game than before. Something that benefits those fifteen hours; the experience doesn't feel drawn out. Luigi's also an entertaining companion to be with during the course of the game. He's scared sure, but the fact that he's still heading in to take out ghosts is endearing. That the fella is clumsy and obviously quivering with fear makes for amusing, yet appealing, viewing. Luigi's adventure is actually one of the finest and most entertaining titles for the Nintendo 3DS. The game does everything right. The mix of humour and ghost hunting will appeal to a wide audience, the 3D effects are good enough to warrant you pushing that slider all the way to maximum, battery life be damned, and the soundtrack sings - you'll be whistling the main theme long after the game's finished. The difficulty increases as an even pace, and no puzzle is so brain-meltingly tough that it can't be resolved. Dedicated players will find there's plenty of secrets to explore for...and this is all without mentioning the multiplayer. Built for up to four players, with three modes and difficulty settings, and available either as local or online, it's a surprisingly fun diversion. You have to explore rooms and capture ghosts as a team, clearing areas before the timer runs out, with collectable upgrades either benefitting the group or just the single player. 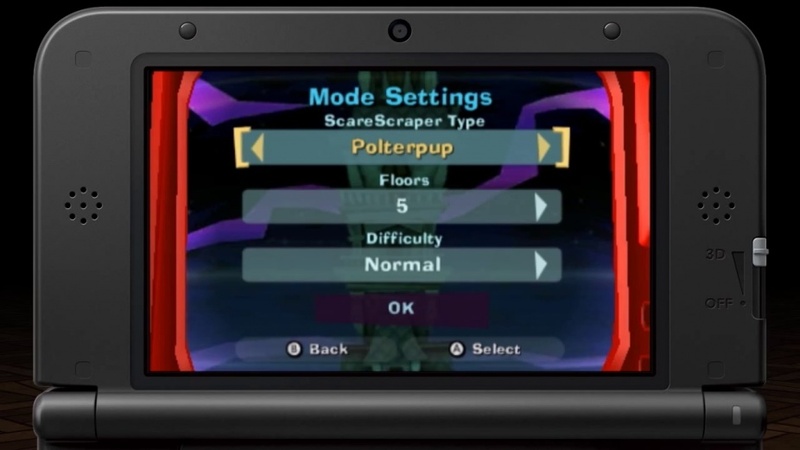 Speed mode has you rushing to find a switch, while Dog mode has you using your torch to follow the tracks of ghosts hidden around the level. If you've got the choice, it'd be best playing the game on the XL version of the handheld. The heavy use of the stick during ghost hunting, as you have to wrangle a spook into your containment unit, leads to some intense sessions, as well as sore thumb come their end. And those sessions length is the only real criticism of the game. Some missions clock in at around forty-five minutes long - too long for a handheld title. It'd be less of an issue if you could save during a mission. But you can't, and quitting early will see you lose all your progress. Obviously you can close the unit lid to set it to sleep mode, but it doesn't quite cut it. It's something to think about if you're prone to carrying the console with you on trips rather than staying at home to play. - Few unique enemies - Missions too long for a handheld game - No mission checkpoints.